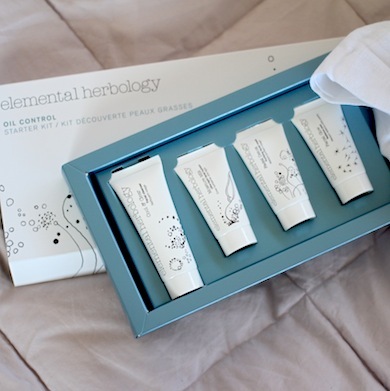 This is a great way to try a few Elemental Herbology products; a starter kit with cleanser, moisturiser, mask and peel. Out of the four products I have already tried three as full sizes and they are all amazing. The Light Moisture Milk was reviewed not so long ago (read the review here) and I am going to review the peel and the wash in the near future. There’s enough product in these little tubes to keep you going for a couple of weeks at least if you don’t get too over-excited with your quantities. A nice way to try a new regime without committing to the full sizes. This kit is great for oily or combination skin, skin that feels a little dull and lacklustre and skin that’s prone to the odd breakout. In terms of price-per-ml, the kit pays for itself with just the moisture milk and peel, so it’s actually very good value indeed. You get 15ml of the milk and the peel (equivalent value over £20), 15ml of mask and 25ml of the face wash as well as a muslin cloth. Brilliant for taking on your travels! There’s a version for drier skin too, the Moisture Replenish Kit.